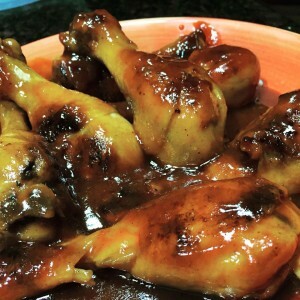 Five-Spiced Chicken Legs | Just Cuc It! 1. Steaming the chicken - in a large steamer, add water to bottom and place chicken on the steamer section on top of parchment/wx paper. Steam for 15 - 20 minutes. You can prepare the BBQ sauce during this time. Make sure the sauce is cooked on med-high for 10 minutes, turn temperature to low and let simmer for another 5 minutes. I steam the chicken to make sure it is cooked through. You can choose to Pan-fry or Grill to finish it. Using a sauce brush, brush the meat with the bbq sauce, turning meat every few minutes and covering the chicken with bbq sauce. The BBQ sauce will caramelize on the surface of the chicken. Turn the temperature down to low and add bbq sauce to pan and allow chicken to cook in the bbq sauce, turning occasionally to coat the meat on all sides.